Individual knitting needle gauge. These gauges are actually black - and measure needle sizes from 000 to 15. There is also a 2-inch window for measuring your swatch! Please note: Our picture shows these in white, but these gauges are now only sold in black. 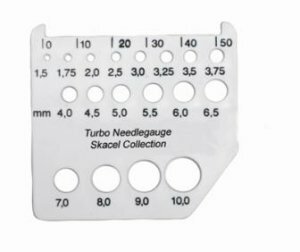 These gauges are actually black - and measure needle sizes from 000 to 15.